OEM Manufacturer of a wide range of products which include filter regulator lubricator. We are a trusted name in the industry for manufacturing and trading Filter Regulatory Lubricator for our revered patrons. 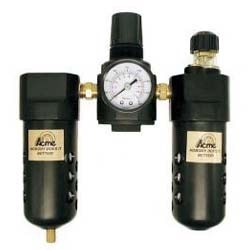 The offered lubricator is made from high grade materials sourced from a reliable vendor base. It is compact in size, easy to install and user friendly. This lubricator is ideal for heavy duty usage, tolerant to high pressure environment and non-corrosive as well. Looking for Tank Accessories ?